Job of a waiter or waitress or a bartender at a hotel, restaurant, resort or bar is not very easy all the time. As a waiter or waitress or bartender you not only have to deal with difficult situations but also have to handle few items which involves risk. Serving alcohol is such a vast subject that you have to handle very much professionally and tactfully. Failure to do so may not only impact negatively in your professional career but may result end of losing your license or even whole business. In our today’s guide, we have tried to cover everything that you would need to know about how to provide responsible alcohol beverage service in restaurant and bar. Serving alcohol responsibly and act in accordance with the law for serving alcohol is considered as one of the most prime responsibilities for a server or the restaurant since law does not allow to serve alcohol to underage or intoxicated guests. And violation of this rule will lead servers, bartenders, manager, and owner of any restaurant to be personally accountable for any unwanted situation or inappropriate behavior occurred by the guests due to excessive drinking even after the guest leaves the restaurant. Servers should know the possible significances of over serving alcohol, the common signs of intoxication, the time limit when to say no to guests and the impromptu steps to be taken for handling any intoxicated guests. Servers must be constantly observant toward the guests for changes in attitude, body language and any other abnormality from normal behavior. That’s why every server and other restaurant staffs have a responsibility to be attentive toward the law or rules for serving alcohol. If guest does not have a driver’s license then verify other acceptable form of identification. Check the physical description on the ID to ensure that you are dealing with the correct person. Match the photo of identification and check the age of the Id with guest. Validate date of birth for approving alcoholic beverage. If guest does not look like photograph, ask for other form of identification. Verify the expiry date of the Id. Check the id carefully to see whether it is real or custom made. 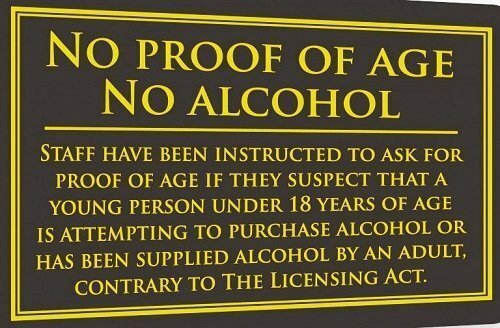 If guest is unable to provide any identity proof then politely refuse to serve alcohol. Receive only the forms of ID that you are familiar with. If verifying process is satisfactory then return identification and thank the guest for keeping patients. Never let guest in without proper checking if the guest is accountable. Ask for management help for any kind of dispute with the guest regarding verifying and checking guest identity. Ask for any proof ID to verify the age of the guest such as driving license or any photo ID with physical description. If any guest looks younger than 30 then ask for driver’s license, a state-issued identification card or a current passport. Handling intoxicated guests is the most difficult task for any server to handle intoxicated guest but if a server serve alcohol responsibly then improper guest’s conduct as a consequence of excessive drinking can be prohibited. Do not ask guests if they will order more or do not take frequent update from the guest while the guest is drinking but always be observant to guest from your pace. If a guest starts over drinking then clearly states him the policy of not over-serving and make him understand the negative consequences of excessive drinking. Offer a complimentary soda, coffee, or water between drinks to slow down guest’s need for over drinking. The guest usually slows the rate of alcohol consumption when dinner is served. So even if a guest does not order dinner, you should offer him dinner by using suggestive selling skill. If the guest become too drunk to serve then refuse the guest directly from serving more. Deal with a drunken guest politely but with a firm voice. Decide what you will say to your guest before shutting off the consumption. Do not hesitate or step back once you have made the decision to terminate service even if the guest constantly trying to tipping you. Never allow an intoxicated guest to cross his limits even if he is from your friends or family. Do not make it public so that your guest feel insulted. Try to talk in low voice. Ask your bouncers stay away unless situation goes beyond control. Try not to use any negative statement at first approach (ex-“You’ve had enough” or, “You need to go home”) with guests. First make him understand the situation and the management policy politely. If a drunken customer enters your bar then do not serve him. First greet the guest with a smile and then clearly tell him that you are unable to serve him. If your customer is continuously demanding and giving you trouble, call management, handover him to the bouncers or call the local police. Arrange taxi or alternative transportation for intoxicated customers. If needed help the drunken guests in reaching his home. But do not let the intoxicated guests to drive. Always Remember You have the right to guard your guests, yourself, and your restaurant’s liquor license so never step back to take right step in the right time and to serve alcohol beverage responsively. Make a responsible alcohol-serving mission statement pertaining to drinking and safety and act accordingly. Restaurant and bar owners should include a designated-driver program which will offer free or less costly nonalcoholic drinks to a driver in their bar operating system. Attach taxi numbers next to the pay phone and also give the taxi numbers to servers to use for helping intoxicated guests in reaching their home. Provide specialized and comprehensive training program in alcohol service to the servers so that they can be familiar with the significant sign including changes in attitude and body language of a drunken person and the policies and laws for serving alcohol responsibly. Less publicity of marketing ideas and promotions that are related with alcoholic beverage. Include main course or dinner items in the bar menu to reduce the risk of excessive drinking. Offer guest nonalcoholic beverage more rather than alcoholic beverage. Record all unwanted instances in a log book. Constantly review and be updated local and state liquor laws and maintain healthy relationship with law enforcement officials. Conduct audits for ensuring practice of policy regarding serving beverage responsibly. I enjoy coming to hospitality school web side. I spent hours of reading and watching videos without seeing the hours passing by. Your comment was so touchy. Thank you very much for these awesome words. Keep learning.